The insensitivity of the Court towards social justice cause and judicial dilution of a stringent protective social justice legislation by resorting to judicial excess in total disregard of legislative intent was seen reflected once again in Subhash Kashinath Mahajan v. the State of Maharashtra and Anr [hereinafter, Subhash Kashinath]. In this case, a Division Bench Supreme Court comprising of A.K. Goel, J. and U.U. Lalit,J. had virtually removed the teeth of the Scheduled Castes and the Scheduled Tribes (Prevention of Atrocities) Act, 1989 [hereinafter, Atrocities Act]. Probably the social philosophy of the judges does play a role in redefining the contours of social justice. Interestingly it was the same Bench that diluted Section 498A of the Indian Penal Code in Rajesh Sharma Vs State of UP. If the judicial wand was aimed at women in Rajesh Sharma Vs State of UP, now it is the Dalits who are at the receiving end inSubash Kashinath. This write-up is a humble attempt to understand how the judges went about with their judicial process in this case. The case was related to alleged atrocities committed by a government servant sitting as a prosecution sanctioning authority under the Atrocities Act. The government servant’s application for quashing the F.I.R. was turned down by the Bombay High Court citing the peculiar nature of the Atrocities Act. He therefore approached the Supreme Court with the same prayer. The Atrocities Act aims at addressing the injustices rooted in the Indian caste system. Considering the hapless condition of the SCs and STs, the legislation, which has constitutional backing, contains several special provisions favoring them. The Act is a materialization of the social justice ideals as contained in the Constitution. It is a build up legislation to Article 17 (which abolishes untouchability) and Article 46 of the Constitution which enables the state to promote with special care, the educational and economic interests of the weaker sections of the society, in particular, the SCs and STs, and to protect them from social injustice and all forms of exploitation. The Act was amended in 2015 to strengthen the position of victims vis-a-vis the perpetrators of atrocities and people who are in charge of investigation and prosecution of offences. The Division Bench was sure that it was toying with accepted terrains of judicial normality and hence was determined to build an elaborate foundation for its uncalled for legislative activity. At the outset, the Court expressed its opinion that it can issue appropriate orders for the enforcement of fundamental rights including Articles 14, 19 and 21. Both substantive and procedural laws must conform to Articles 14 and 21 and a procedure has to be just, fair and reasonable under Article 21. The court felt that “no procedural technicality can stand in the way of enforcement of fundamental rights”. Directions issued with a view to enforce fundamental rights may sometimes be perceived as legislative in nature. Such directions can certainly be issued and continued till an appropriate legislation is enacted. Supreme Court’s role is not just limited to “dispute settling and directions can certainly be issued which are not directly in conﬂict with a valid statute” (paras 31-34). The Division Bench is right in holding that directions which are legislative in nature may be issued by the apex court to do complete justice. But these kinds of measures are resorted to when there is a lacuna or when a particular law is ambiguous. When the legislative intention is crystal clear there is no need for such extravaganza. Under any circumstance, a judicial entity shall not tread a path that is against the declared object and purpose of an Act. The two judges in Subash Kashinath attempted such an exercise in a bid to dilute the Atrocities Act. We will examine that in the sections that follow. Having felt successful in building a foundation for its excessive judicial legislation, the Court then ventured into examining its own decisions regulating the power of arrest. It also relied on Law Commission’s recommendations that a person is to be arrested only if there is ‘credible information or reasonable suspicion’ and for preventing further offence; or for proper investigation; or to check interference with the evidence (para 36). On this front too, the Court was against the accepted canons of law as revealed in the following parts. Does the Atrocities Act Perpetuate Casteism? The Division Bench’s observations regarding the link between casteism and the Atrocities Act exposes its limited understanding of the historical and present realities of the institution called caste. It observed that the Act should not ‘result in perpetuating casteism which can have an adverse impact on the integration of the society and the constitutional values’. Secularism is the basic feature of Indian Constitution. Caste or religion should not adversely affect equality guaranteed by the Constitution. The Division Bench put forward an interesting hypothesis that castes are ‘anti-national’ and division among caste lines act against national integration and that constitutionally guaranteed ‘fraternity can be a fact only when there is a nation’. (para 42-47). For this reason there should be a ‘check on false implication of innocent citizens on caste lines’. The Division Bench misses a crucial point here. All walks of Indian life are infected with casteism. Equally, all limbs of the state and power exerting institutions are thickly populated by socially advantaged castes. Humiliation and discrimination that the SCs and STs experience at the hands of the socially advantaged castes can be fully understood only by people who are at the bottom of the caste pyramid. By juxtaposing the powerful and most vulnerable sections of the society, the court was aggravating the injustice meted out to SCs and STs. Dalits are the people who yearn for fraternity and integration. Without uttering a single word on the animal like existence of SCs and STs for centuries and which is still continuing, the Court was adamant in magnifying the casteist potential of the Act, that too on the basis of the perceived threat of false complaints. If the Court was branding the usage of the identity of caste for social justice purpose as anti-national (again it is the court’s subjective feeling that there is a high percentage of false complaints under the Act), it is a soft-criticism that the judicial wing too has its share in aggrandized brahminical nationalism. What is the judicial legislation here? As we have already seen, judicial legislation is justified to a certain extent. Judicial law making is justified within the permissible limits. The Court’s acrobatics in that direction have to be analyzed to find out whether the attempt at judicial legislation is justified. The focus areas are the exclusion of anticipatory bail under the Act, registration of F.I.R and arrest of faulty persons under the Act. In Balothia (1995) 3 SCC 221, while upholding the validity of Section 18, the apex court remarked that if anticipatory bail is granted, in the ‘context of prevailing social conditions’ it is likely that ‘perpetrators would intimidate the victims and prevent or obstruct them in the prosecution of these offenders’. Though the present Division Bench found merit in the argument that theBalothia decision may be revisited in light of decisions like Maneka Gandhi, the court did not feel the need to refer the case to a larger bench so that Balothia could be clarified. The judges felt that Section 18 exclusion shall be applied to genuine cases (where there is prima facie case of atrocity and the case squarely falls under the Atrocities Act) and not to false cases (para 50-52). Judges claim that a purposive interpretation rather than a literal one is adopted to do justice in individual cases, yet the reasons suggested for distinguishing the ratio of the Balothia case appears to be fragile. If the present bench had a different view it would have been better to constitute a larger bench. A genuine purposive interpretation would have ratified the object and purpose and express provision of the Act. Two individual judges make a try at substituting its own wisdom for that of the law makers. This judicial legislation goes against express statutory provision and consequently does not stand justified. Precedents and normal rule suggest that F.I.R. shall be registered when information reveals commission of a cognizable offence. But the Court in the present case felt that “…cases under the Atrocities Act also fall in exceptional category where preliminary inquiry must be held. Such inquiry must be time-bound and should not exceed seven days…” Why cases under the Atrocities Act fall in exceptional category is a vexing question. The conclusion is based on the feeble premise that majority of the complaints under the Act are fake. Innovative ways are engineered by the Court to make it difficult for a harassed dalit person to register an F.I.R. and it should be remembered that delay in filing F.I.R. is a major bottleneck resulting in the acquittal of offenders under the Act. Even after a preliminary enquiry is held and a case is registered, the Court felt that arrest is not a necessity. So if after preliminary inquiry, no other offence (for which arrest can be recorded) other than offences under the Atrocities Act is made out, in case of a public servant, permission of the appointing authority and for others, written permission of the Senior Superintendent of Police of the District is needed. Permissions must be granted for recorded reasons served to person to be arrested and the concerned court. The magistrate should apply his/her mind to valid recorded reasons to allow further detention. For a Dalit, securing proper non-delayed investigation and successful prosecution is almost improbable which result from intimidation of victims and witnesses. The requirement of prior sanction would worsen the problem of delay in prosecution and hostility of witnesses. The Parliamentary Standing Committee Report (2014-15) records that securing justice “remains difficult for a majority of the victims and the witnesses as they face hurdles virtually at every stage of the legal process – from registration, investigation and charge-sheeting of the cases”. As K. Krishnan notes, ‘the problem faced by SC/STs vis-a-vis many public servants is that they fail to perform their bonafide duties’. False Complaints-Whether an Amplified Problem? Now it is to be seen whether the Court’s apprehension of false complaints is supported by actual facts and figures. 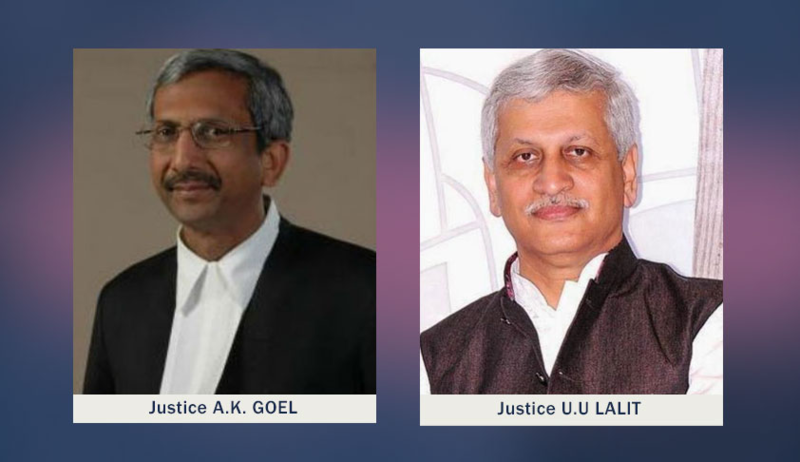 The Division Bench emphasized that for the last three decades “it has been judicially acknowledged that there are instances of abuse of the Act by vested interests against political opponents. The Court relied on the statistics provided by the National Crime Records Bureau, various High Court decisions and observations of the Parliamentary Standing Committee (PSC) to drive home the point that “there is need to safeguard innocent citizens against false implication and unnecessary arrest for which there is no sanction under the law which is against the constitutional guarantee and law of arrest laid down by this Court”. cases. By extracting a sentence from the PSC report out of context, the Division Bench posited false complaints as a major problem. Earlier the Centre had rejected the PSC recommendations in this regard because high rate of acquittals does not mean cases were false. Higher rate of acquittals occur due to poor investigation and hostile witnesses (on account of inadequate protection for them). This is precisely why the 2015 Amendment to the Atrocities Act has provisions to strengthen the victims vis-a-vis perpetrators, investigators and prosecutors. In addition, drawing inputs from a few High Court decisions that attempted to gauge the mood of a nation, the Division Bench knocks at the door of recklessness. These all show that the sources relied on by the Division Bench to blow up the problem of false complaints actually are not enough to support such a point of view. The Court, in fact, was creating a de novo presumption that cases falling under the Atrocities Act are bogus. Prejudiced by the illusory supposition, the Court was attempting to strengthen the defenses via, reinstatement of anticipatory bail, preliminary inquiry to register F.I.R. and prior sanction for arrest would help the authorities and alleged (innocent) violators. K.Krishnan points out that the present case is related to government servants which is not typical of bulk of atrocity cases and the Division Bench’s sweeping conclusions would affect a large number of victims. At its best this case was not a perfect one to exaggerate the problem of false complaints under the Act and the Court erroneously engaged in judicial lawmaking that was uncalled for. More than the problem of excessive judicial legislation, the Court was intentionally attempting to crush the legitimate legislative intention. In essence, this decision sends out loud and clear message to the subordinate judiciary and law enforcing agencies, which are already sitting on the edge of the wall, to be apprehensive about cases falling under the Atrocities Act. Author is an independent researcher.